Lexbe eDiscovery Platform productions include non-privileged and non-redacted native files in the system, including native attachments to emails and natives expanded from Zip and other supported container files. However, the 'ORIGINAL' sub-folder as part of productions out of Lexbe eDiscovery Platform will not include email MSGs, Zips or other container files. This is done to assure that native versions of privileged, work product or redacted documents that as nested inside of container files are not inadvertently produced. A-Run your production from the Production Job page. B-Click on the Production Title you just completed and from the Browse page apply filters to display only the file extension (e.g. 'MSG', 'Zip'). C-Select the resulted filters by file extension from the current production and export to a Briefcase, and then save the Briefcase folder to your local desktop. 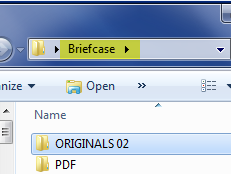 E-Finally take from the Download Briefcase folder the 'ORIGINALS 02' sub-folder, and then add it to the Production folder directory. In this case if the PDF version of the file is not legible (e.g. 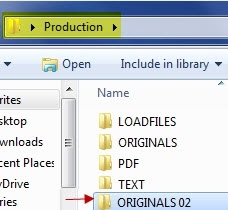 placeholder), the same file under the 'ORIGINALS 02' sub-folder can be opened in Microsoft Office or other native applications on a local computer and reviewed. Please Note that the Lexbe eDiscovery Platform Briefcase functionality is not designed for productions and it does not contain safeguards included in the Production functionality. Producing container files can also be very risky and error prone, especially if you consider a large database and you don't have left enough time to meet deadlines. This practice is bypassing procedures designed to prevent inadvertent release of Privileged documents when you produce email and other container files. You can have a collection of native emails (MSGs) in a case successfully converted to PDF in Lexbe eDiscovery Platform. But if you or opposing counsel cannot open in Outlook directly and see all the text in the body, that is an issue related to the version of Outlook. Please note that viewing outlook emails natively is a complex matter and there are many outstanding versions of Outlook and the MSGs could be not fully supported in various versions of Outlook, the version of Outlook used may have bugs with regard to these particular emails, the emails could be partially corrupted, opposing counsel could have a corrupt installation of Outlook or a variety of other reasons. Our ability to convert the emails successfully may show that the data is present and we can extract with our libraries and probably other email clients could display as well.